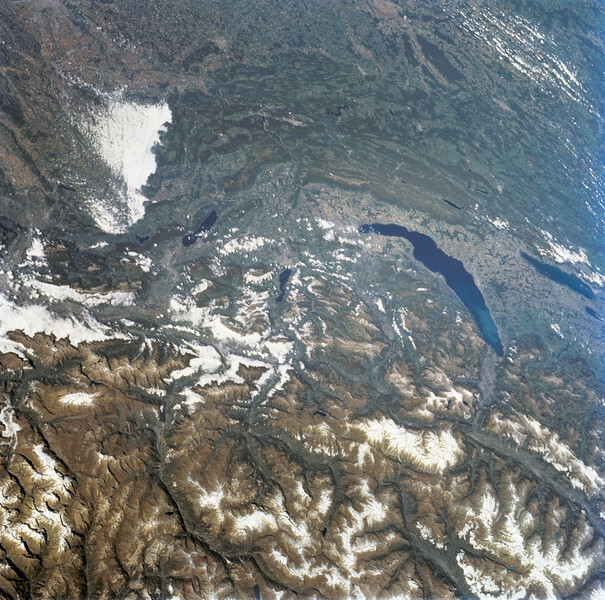 Astronaut Tom Jones: gIt's rare to get a cloud-free pass above the Alps; here is a treat from Space Radar Lab 2. Lake Geneva dominates the center right; Geneva city is at the left, narrow end of the lake. Lake Geneva is fed by the Rhone River, with its spectacular right-angle turn to the east upstream from the lake. At far right center is Lake Neuchatel; Berne is just out of view, to the right. Lac du Bourget is the small lake left of center. Lyons is under the clouds at upper left. Here in early autumn, the snows have not moved into the Alps as yet, but a few high glaciers are still beautifully evident to my crew. From NASA: Parts of the Swiss Cantons of Vaud and Valois, the French province of Chablis and parts of northwestern Italy are seen in this widely stretching image photographed from the Space Shuttle Endeavour. Pennine Alps, said to have been created 50 million years ago, have been reshaped by glaciers during Pleistocene. The glaciers created the wide valley of the Rhone River by scourting a pre-existing seam. The fertile Swiss Plateau runs northwest from the shore of Lake Geneva and is visible in lower left. The Franco-Swiss border is located in the center of the lake and follows a mountain divide east of Rhone Valley. Italy lies south of the Rhone.